Larry won " Cat of the year 2006 +7+8+9" in CZ and "MISTER AUSTRIA 2006+2007+2008"
Cinnamon and fawn color was recognised on GA in Bukarest 26.5.2011. Thanks all who helped with it. These website will be updated soon. Many informations are more than 3years old. And probably few people make their opinions from these informations. All kittens are reserved. Our plans are kittens during summer 2013. Cinnamon, blue and lilac. New pictures of kitten "J"
New kittens - cattery "from Ja-Pan" (my husband). 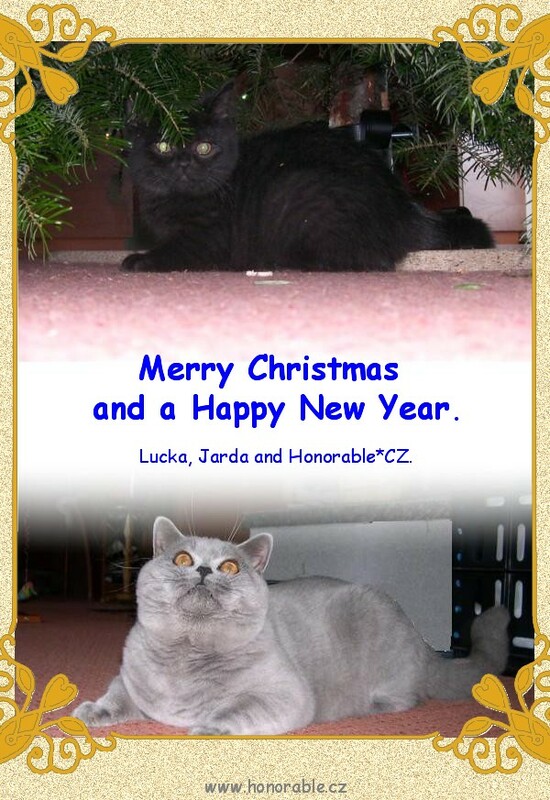 We have chocolate and cinnamon lady, very nice choco-tortie girl and lilac boy. All carry cinnamon. We have kittens black, creme boys and tortie girl. All babies are carry cinnamon. Cinnamon and fawn color was recognised today on GA in Bukarest. Thanks all who helped with it. New babies in blue and black color. 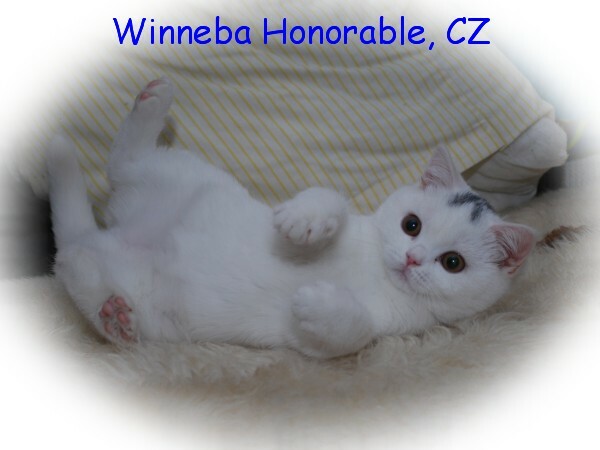 Our Winneba won BIS kitten on show in Olomouc. We organise presentation (recognition) FiFe show for cinnamon and fawn color. This will be in Olomouc on 4.12.2010. This colors are for free on this show. 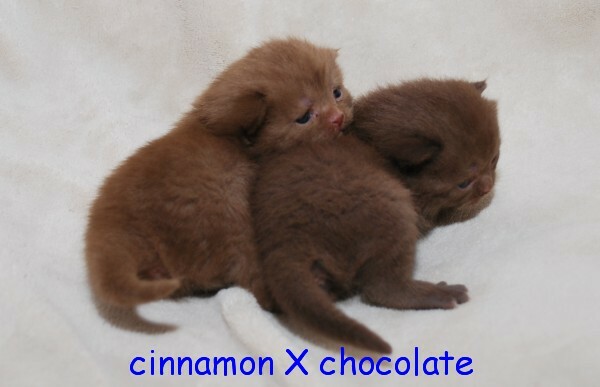 We have cinnamon babies. Red are expected. After longer time some news. New cats in our cattery. Las Vegas finished titel "Junior Winner" - contragulation ♥☺♥ to him and also to his owners. and Best of Best I today. We have free white boy. His father is Greenwich. White kittens were born on Saturday 13.9. White boy free. Their father IC Greenwich Honorable won BIS on Sunday. Kittens were born on 11.7.2008. All are chocolate carry cinnamon. Ghana won BIS female both days on the show in Cecina (IT). She got BIV also. This weekend was really "show-weekend". Our kittens Kamchatka got BIV on the show in Krems (AT). Egypt finished GIC on Saturday in Ljubljana (SI), he was also nominated, but winner was his father - our Larry :-) Larry won also special BRI show in Ljubljana. We got also information from Ghana. She was on the show in Faenza (IT) last weekend. She was showed in class9 for the first time. She got certificate and nomination. 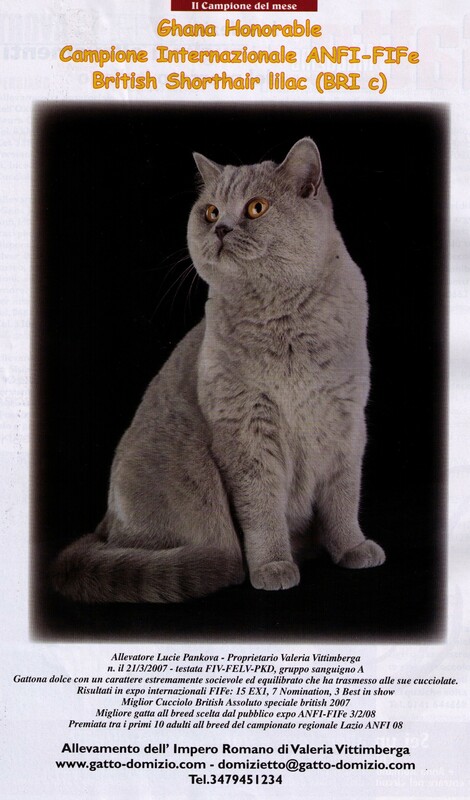 Her owner was the happiest from her winning - she was chosen by visitors as the best cat of all show. We are congratulating her. New photos with kittens "L". We have one free solid red boy. We have solid red kittens. 3boys and 2girls. We are expecting also cinnamon litter in February. Red litter is expected on the end of January. WorldShow - Bratislava: Larry was the best BRI a - he won BIV, also nominated. The winner in BIS was Bengal tom this year again. We thanks for all our and Larry´s friends who keeped fingers to him. We couldn´t to say thank you to everybody in Bratislava directly. Last weekend was very successfull for our kittens. Greenwich won BIS 6-10 in Pécs (HU) and Ghana won best BRI 6-10 and total kitten in special BRI show in Rome (IT). Yesterday Greenwich won again BIS 6-10 in Celje (SI). Today "only" nomination. Larry went for this show also (after a small pause) he was Best of Best 2 both days. New site with Greenwich (between "boys") and India ("girls"). New photos "K" and "J" kittens. Ghana Honorable was nomited both days on the show in Pisa (IT) 15.+16.9. Gratulations from us. Egypt Honorable won BIS on the show in Bratislava. We are gratulating to him. New photos with kittens. We have last free lilac boy - "Kyjev". After longer time are some news: our first solid red kitten was born on Friday 3.8.2007. It is very n ice girl - "Jamaica Honorable, CZ". There is also her photo in the section "kittens". One white w62 girl "Italy Honorable" is still free. She is very nice and could be for breeding and shows. We have white kittens - girls probably. Mother is BRI w62 IC Márinka Amaya, CZ, Father BRI d CH Philip von Alfersesch, DE. Next photos of kittens after our holiday. New photos of "G" and "H" kittens. Larry won title "MISTER AUSTRIA 2006"
New photos - both cinnamon kittens Bear and Olga. All "D" kittens have new home. Last two free black boys from litter "F". Francisco as a pet. Finland for shows. Cat show in Wien 9.+10.12. 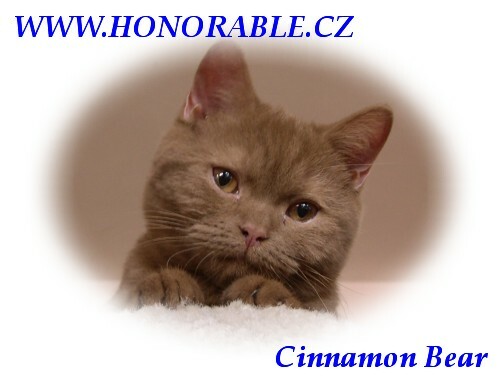 Cat show in Olomouc: Larry on Sunday BOS, Elba Honorable - on Saturday nominated BIS, Egypt Honorable - on Sunday BIV and nominated BIS. Rabea was on Saturday BIS 6-10 month, on Sunday was monimated. Litter "D" was the best litter on the cat show in Poznan (PL). This website is only for general info. For actual please contact me.